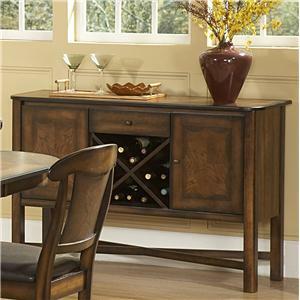 Showing off a beautiful traditional style is this timeless dining server. 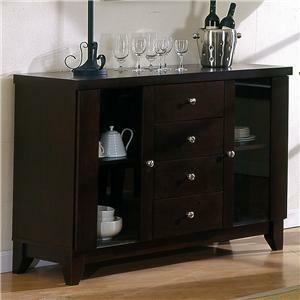 Tall turned legs pair with elegantly paneled doors to create a classic look while a pair of drawers add valuable storage. A spacious top allows you room to show off some fine china or your favorite accent piece. 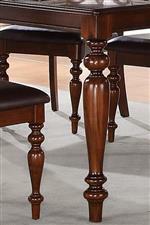 The Creswell Traditional Dining Server with Turned Legs by Homelegance at Carolina Direct in the Greenville, Spartanburg, Anderson, Upstate, Simpsonville, Clemson, SC area. Product availability may vary. Contact us for the most current availability on this product. From elegant turned legs to beautifully crafted seatbacks this traditionally styled Creswell collection is perfect to complete your dining room. 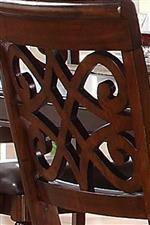 The rich cherry finish is not only gorgeous but also provides a sense of sophistication. Chairs in this collection offer comfort thanks to upholstered seats while turned legs add further to the timeless look. 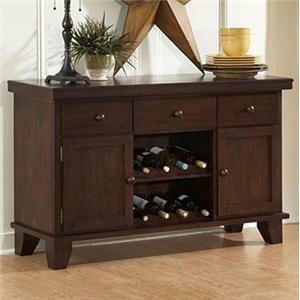 The Creswell collection is a great option if you are looking for Traditional furniture in the Greenville, Spartanburg, Anderson, Upstate, Simpsonville, Clemson, SC area. Browse other items in the Creswell collection from Carolina Direct in the Greenville, Spartanburg, Anderson, Upstate, Simpsonville, Clemson, SC area.